This book, first published in 1987, looks at the processes and spread of social innovation: the mechanisms of this innovation are rooted in the conflict that minorities are capable of creating in others and introducing into the social system. These innovations give rise to rejection, discrimination and denial of the minority group. However, minority ideas take root and gradually new norms replace the old ones. Despite the denial, therefore, the marginal standpoint of minority groups can have an impact on the belief systems and behaviour patterns of other individuals. This book proposes a psychosociological explanation of these individual and collective phenomena by articulating the underlying identification games and cognitive activities. It throws fresh light not only on minority influence, but also on major themes of social psychology, especially theories of intergroup conflict, persuasion and attitude change. 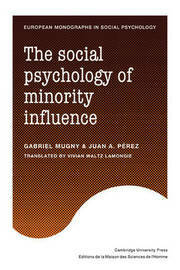 Based upon a series of experiments which have been developed and refined for the 1991 English edition, this is a rigourous and valuable contribution to the study of minority influence on social processes.